Mike*, our foundation client and a dear friend, sent us a really bearish broker note as if John Hempton - a shortseller by inclination - needed to get more bearish. He was adjusting his portfolio accordingly. We won't be. The bear case always sounds intellectually more convincing than the bull case. And it is in this broker note too. Intellectual sounding and convincing. But America is still an amazingly innovative country, humans are ingenious and most of the imbalances will sort themselves out. Big cap equities are cheap relative to almost all other assets (especially relative to small cap equities, cash and bonds and to many assets such as commercial property that require leverage). Cash yields almost minus 3 percent after inflation and less post tax. Bonds are scary as hell and yield minus 1% after tax and inflation. Big though difficult-to-run companies are at low teens multiples. Great franchises are at mid-teens multiples. Tesco (UK) which is a truly great franchise - is at a 14 PE ratio. And the Pound is historically cheap. WalMart and Target - both slightly less good franchises - are at 12 times. The difficult parts of Silicon Valley (eg HP) are well under 10 times PE ratios (and we feel no need to own that one). The less difficult parts of Silicon Valley (Google for instance) are at a high teens PE ratio once you take out the excess cash. We own that. Own equities. Don't kid yourself. Mega-cap equities are generationally cheap compared to other assets - and certainly compared to the cash/bond/levered asset complex. Just don't be blind about it. The places that there have been high returns (Asia, small caps, smaller resource companies) are riddled with fraud. Twenty five years of deregulation and the high levels of innovation mean we have high and rising levels of stock fraud. Fortunately there is much less fraud risk in mega-caps. Don't own Australia or the iron-ore-coal-steel complex. It has run too far and has been too easy to make money. Too many stupid/aggressive/greedy people are doing too much expansion. Some of these people are stupid - but they have made much more money than you or me so they must be right! I can find dozens of reasons to be bearish - but I look at it dispassionately and I am bullish on big caps, and bullish on America. The problems will sort themselves out and the American exceptionalism (decent institutions, free enough markets and a willingness to take risks) will work their magic again. Just don't get greedy by buying things you do not understand: you will be ripped off. The underlying fraud level is as high as I have ever seen it. Also the French are in that lovely position of having convinced newly rich Asians that they are the arbiters of good taste. There are few higher ROE businesses. France has played Asia better than America. We can see plenty of reasons to be bearish - but just the frauds makes our portfolio short enough. Indeed we are plenty short and likely to remain so until I can't find frauds with ease. Beyond that, there is a lot of pessimism around. It has got to be time to be bullish. We certainly do not desire being 125 percent net long or hyper-aggressive like that - but we will take steps to become incrementally longer. We are if anything too short. *Mike is not his real name. PS. I want to stress again that my cheap mega-cap equities are relative to other things a rich guy might own - such as small cap equities, bonds, cash, commercial property or gold. There are ways cash could be a better investment - hard deflation. Long bonds are probably the best investment in that environment. I do not see that happening (though I did think it a possibility 18 months ago). Equities were generationally cheap in absolute terms March 2009. I was buying but nowhere near enough - and indeed we carried some losing shorts through the second six months of 2009. I have read the accounts of several dozen Chinese reverse takeover stocks and many traditional IPOs, mostly looking for fraud but also looking for stocks to go long to offset my naturally large short position. And I am annoyed. China Fire and Security (CFSG:Nasdaq) was on my list to look at but I never got around to it. So I took the recent news of a "definitive agreement" to buy CFSG by Bain (a large and reputable private equity shop) very badly. After all it was a profit opportunity wasted because I never got around to reading the accounts. Barclays Capital is serving as the exclusive financial advisor to the Special Committee [that is CFSG on behalf of non management shareholders]. Shearman & Sterling LLP is serving as U.S. legal advisor to the Special Committee and Bilzin Sumberg Baena Price & Axelrod LLP is serving as Florida legal advisor to the Special Committee. Bank of America Merrill Lynch, The Hongkong and Shanghai Banking Corporation Limited and Citigroup Global Markets Asia Limited are serving (themselves or through their affiliates) as financial advisors to Bain Capital as well as underwriters, bookrunners and mandated lead arrangers of the debt facilities. Kirkland & Ellis International LLP is serving as U.S. and U.K. legal advisor to Bain Capital. Davis Polk & Wardwell LLP is serving as U.S. legal advisor to Barclays Capital. Allen & Overy is serving as U.S. and U.K. legal advisor to the underwriters, bookrunners and mandated lead arrangers. DLA Piper and Han Kun Law Offices are serving as international and PRC counsel to Mr. Weigang Li [the Chairman of CFSG]. This is by far the best team of big name lawyers and advisers ever assembled to do a deal with a sub-$300 million market cap reverse takeover Chinese stock. There must be quality here to assemble such a big name team. And I want to be able to pick these transactions in advance so I went looking for the quality. I read the 10K cover to cover (all 87 pages) just to see what they saw. After all Bain are clever people and the advisors assembled are not stupid. What I found was a strange company – one that I did not understand – in fact one that made me think I don't understand very much at all. The clever people at Bain want to buy this company with a value of almost $300 million – and – for the life of me I could not have picked it. We are engaged primarily in the design, development, manufacture and sale of a variety of fire safety products for the industrial and special purpose infrastructure industries and the design and installation of industrial fire safety systems in which we primarily use our own fire safety products. To a minor extent, we provide maintenance services on our industrial fire safety systems for our customers. 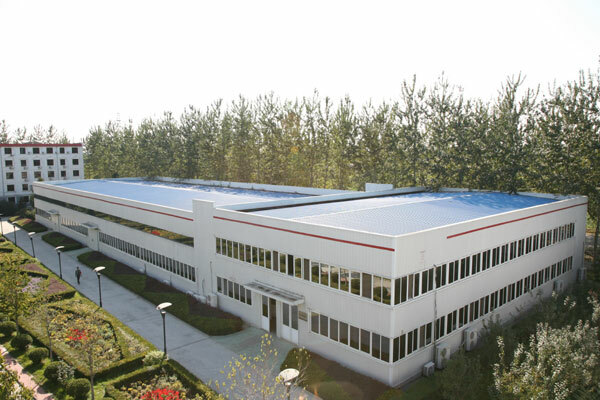 Our business is primarily in China, where we operate sales and liaison offices in more than 20 cities; we are also expanding our business overseas by providing integrated fire safety systems to industrial clients globally. We market our industrial fire safety products and systems primarily to major companies in the iron and steel, traditional power generation, nuclear power generation and petrochemical industries in China. In the last two years, we also secured several contracts with power generation plants in India. We are further developing our business in the transportation sector, which includes projects involving subways, highway tunnels, high speed trains and marine transportation, and telecommunications. We have internal research and development facilities engaged primarily in furthering fire safety technologies. We believe that our technologies allow us to offer cost-effective and high-quality fire safety products and systems. 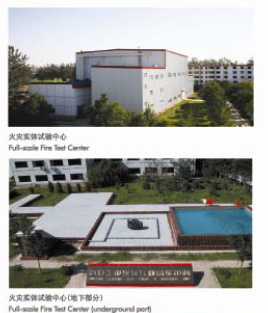 We have developed products for industrial fire detecting and extinguishing. We believe that we are the leading manufacturer in China of such systems having successfully developed a comprehensive line of linear heat detectors. ...Our key products include linear heat detectors and water mist extinguishers. In other words they are a manufacturer and installer of fire detection and extinguishing kit. The kit they install is primarily the kit they manufacture. There is a small maintenance sideline. The products did not sound very technical. Water mist extinguishers are just devices (usually pressurized cannisters) that spray out a water mist for putting out Class A fires. You can find lots of suppliers on Alibaba. Linear heat detectors were a little newer to me. They are wires that can detect raised heat anywhere along their length - usually two wires with a heat-sensitive polymer core. Here is an example - and you can find many of them (with their control boxes) on Alibaba. Bluntly then - at the core of this business is a manufacturer. I was thus expecting a balance sheet and profit and loss account typical of a manufacturer. A manufacturing business is usually concerned with managing working capital (inventory turns, work in progress, billings), has a fair bit of plant and equipment and margins which are typically high single digit percentage, though higher if the level of R&D is high or lots of capital is employed in the manufacturing process. Fatter margins come from market structure (monopolies or government protection) or lots of capital employed (which has to be recovered) or from being innovative (and keeping competition out by know-how advantages). Alas the accounts are nothing like that. The balance sheet left me gob-smacked: I have puzzled and puzzled over this. This is amazing. The company has $41.9 million in accounts receivable: over 6 months of revenue employed in working just there. Then it has $40.7 million in costs in excess of billing. Another 6 months revenue employed there. And another $10.3 million in prepayments and deferred expenses, $1.1 million in employee advances, $1.7 million bidding deposits, and a relatively trivial $6.7 million in inventories. The company has deployed over 100 million dollars in working capital on behalf of their customers and they count all that as current assets. This company looks like it is in the business of financing their customers. Three are also 14.4 million in notes receivable and that looks like explicit customer financing. I am an accounting geek - and I can't resist an accounting geek's aside here. Current assets are - by definition - assets that the company can reasonably expect to turn to cash within a year. (If they take longer to turn to cash they are not current.) This company has more than a year's revenue locked up in working capital. Can someone explain to me how it is possible to consistently have more than a year's revenue locked up in working assets and have them all counted as "current"? So the company is thin on inventory but very strong on financing their customers through receivables and through costs in excess of billings and even through notes receivable. They have 9.6 million dollars of plant and equipment - less than 10 percent of their working capital provision. If you look at the balance sheet this is not a manufacturing company (there are very few actual manufacturing assets). This is a finance company financing its customers (conventional and nuclear power stations, petrochemical plants, railways etc) through working without billing and by being slow to collect. They also explicitly provide finance through notes. Very strange. Especially as the customers almost certainly have better access to funding that what is really just a little fire-and-security company. Fortunately for us the plant and equipment line is further broken down in the 10K. Now I am really puzzled. Before depreciation they only have 900 thousand dollars of machinery. They have three times more "transportation equipment" (trucks and cars) than machinery. They even have more "office equipment" (computers, desks) than machinery. Come to think of it - there is not much in in these accounts for buildings either: $7.5 million before depreciation. Even in China that buys a single large building. It hardly buys a campus. Whilst the company is extremely willing to finance its customers (by extending credit through large receivables or by work in excess of billing) it does not draw much funding from their suppliers. The main thing to note here is that the "working capital liabilities" are much smaller than the "working capital assets". They only have 7.7 million in accounts payable for instance versus over 40 million in accounts receivable. There is no debt - but there are 19.7 million in accrued liabilities - all subcontractor expenses. This is a really strange company: its a manufacturing company whose balance sheet contains next to no manufacturing equipment but vast extensions of credit to the customers. It is certainly not the business described in the "business description" part of the accounts. Gross margins are over 50 percent of sales. Net margins (even in the relatively poor 2010 year) were 17.5 million/80.0 million or almost 22 percent. I like to break this margin down into the two things the company does. The company seemingly provides credit to all its customers (I think we demonstrated that above), and it does manufacturing and installation. It provides roughly 15-18 months credit to its customers (look at the working capital provision). It should make about 7 percent margin on that (just reconfigure as a loan). The rest of the business makes about a 15 percent operating margin. That is down sharply from prior years - but is still a quite nice manufacturing margin. It is a staggering manufacturing margin for a business which has almost no capital employed in manufacturing equipment. All that margin on only $900 thousand of machinery in a manufacturing business is really strange. So what manufacturing equipment do you get for $900 thousand? The key to this is working this out is going to be what sort of equipment they use and whether they really do anything special on it (deserving fat margins) - and how on earth do you run a large manufacturing company with only $900 thousand of machinery. So I went looking at their website for pictures of the plant and machinery and (thankfully) the company obliged. Here is a sampling. Alas some of the pictures are very low resolution. I did not take them: they came from the company's website. 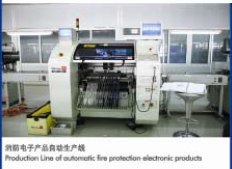 The caption on the above photo is "Production Line of automatic fire protection electronic products". The captions on these are "Full-scale fire Test Center" (both above ground and underground section). This photo was captioned "The photoelectron workshop". 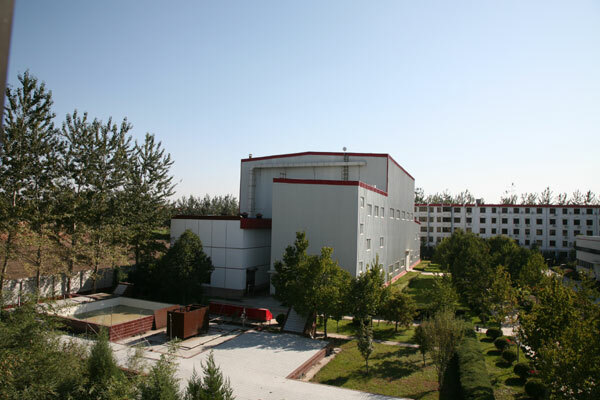 The whole campus is shown on their web-page with the main manufacturing subsidiary (Sureland) in the background and the two main other buildings in the foreground. There is a little wide-angle to exaggerate the size of the campus - but there are still three substantial buildings plus the underground testing center. These are not the only buildings the company uses. These are a pretty impressive set of buildings. It is surprising that they can be purchased for $7.7 million (pre-depreciation) as per the accounts. I thought they might be leased but the words rent or lease do not appear anywhere in the annual accounts (except where they lease a house for one of their executives). So we can presume these buildings are owned. A fire testing facility (especially an underground one) would have some equipment in it - but probably not much as it gets burnt every now and again (which is presumably what "testing" is about). I have absolutely no idea what they do in a large "photoelectron workshop" but I figure it must be full of equipment. Whatever - there is a lot of building here for $7.7 million and (presumably) a very large amount of equipment filling those buildings (with a cost of only $900 thousand). I am startled. By this time I confess: I don't understand. China frauds seem to be blowing up when the company fails to get an audit report. That is what happened to Longtop Financial Technologies, Unversal Travel Group, China Media Express, and China Agritech (just to mention the ones covered on this blog). But China Fire and Security had a clean, unqualified annual report. There was no auditor resignation. Frazer Frost's website is now dead and has been for a few weeks. Still - Bain are taking this company private. I hope they have double-checked the obvious audit problems. The most obvious problem is determining whether the current assets (most notably receivables and work done but not billed) are real. Bain are competent people - I presume they have done that. If Bain need help in checking receivables may I suggest Ernst & Young. E&Y have uncovered several receivable frauds in the syphilitic puss bowl (Singapore Stock Exchange) including China Hongxing Sports. But Bain are clever people so I presume they have that covered. That is a pretty remarkable lot. Whilst I usually dislike appeals to authority I have to cede to such an overwhelming collection of intellect. So what does Bain see in the deal? Once you work through all this - and you accept the accounts as the gospel truth - you realize that Bain has a true bargain. This is possibly the most efficient purchaser/constructor of buildings in China if not the world. They purchased all those buildings for $7.7 million. They are without question the most efficient purchaser or constructor of machinery in the world. They equipped this entire company with machines for $900 thousand before depreciation. They also have a huge and presumably easy to collect lot of current assets outstanding. There is $150 million in current assets here - and they should - with better management - be able to turn $100 million into cash without impacting the business. After all, the customers are solvent parties that do not need all that credit extended to them. $100 million additional cash plus the $28 million cash on the balance sheet will offset more than a third of the purchase price for the business. It should pay off the bulk of the bank debt so Bank of America should be fine. This deal is a work of genius. Unfortunately as a stockholder I will not be around to enjoy it. CFSG is going private.